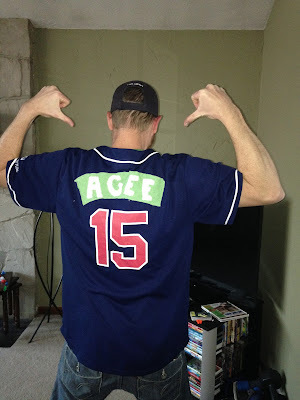 It was five years ago when we first celebrated Jon Agee's birthday with an author birthday blog post. Many things have changed with our family since that first celebration, but something that hasn't changed is how much we love his books. I get excited every April to reread many of our favorites but I have found that I need a Jon Agee fix more than once a year. A few years back, during one of the times I was craving a zany Jon Agee picture book, I discovered The Other Side of Town. 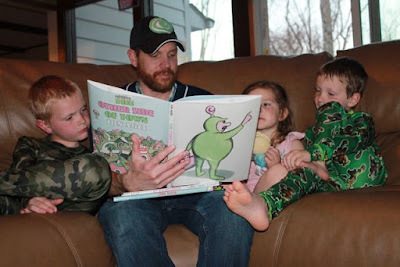 This book became an instant family favorite. We have read it countless times and check it out from the library quite often throughout the year. For Jon Agee's birthday, I challenged myself to come up with something fun so I could share with you how much we love this book. Jon Agee is the author and illustrator of over 30 books including The Retired Kid, Terrific, My Rhinoceros, Nothing, and Milo's Hat Trick. When he was a young boy his mother had a clear vision for his future. In an interview with Authors Revealed he said, "My father tells me that my mother brainwashed my sister and I. We had no choice but to be artists...because she herself is an artist and she put a crayon in our hand and took every drawing we had and saved them and put them in boxes. I still have the little books I created when I was a boy." Jon experienced success as an artist at the early age of 17 when one of his drawings was published in the New York Times. He went on to study painting, sculpture, and film making at Cooper Union School of Art. Near the end of art school Jon was leaning toward exploring film making as a career, but thought many of his drawings and cartoons could possibly be published. He approached many editors but they weren't interested in the drawings themselves. However, they were intrigued by some of the ideas and suggested that he try writing children's books. At the time it was October and Jon "naively" thought he could write a story about Santa and get it published by Christmas. He wrote the story, received interest, and it was published, not that year, but the following year as If Snow Falls (1982). (Intersect Podcast). His first book was followed up by Ellsworth and Ludlow Laughs. He received much praise for his fourth book, The Incredible Painting of Feliz Clousseau including a blessing from Maurice Sendak. Sendak told him he thought the book should win a Caldecott despite being up against one of his own books. (jonagee.com). Neither Agee or Sendak won a Caldecott that year, but Jon did receive many awards for the book including an American Library Association Notable Book recognition and being named a Best Illustrated Book of the Year by the New York Times. Whether it is his word play books on palindromes or his latest picture book It's Only Stanley, I find that the more our family reads books by Jon Agee, the more we love them. The Other Side of Town is a story about a New York City taxi cab driver who picks up a strange little man wearing a green and pink outfit. The strange man asks to be taken to Schmeeker Street, but the taxi cab driver questions him, "You mean Bleecker Street?" The strange man insists on Schmeeker Street and shows the driver the way. They pull up to a wall and the strange man pushes a button on a remote control to open the way to the Finkon Tunnel. The taxi cab driver says, "You mean the Lincoln Tunnel after Abe Lincoln," but the man says, "No, the Finkon Tunnel after Gabe Finkon. He's famous on THE OTHER SIDE OF TOWN." Agee's funny word play creates a parallel universe that the taxi cab driver crosses into only to return to his home in New York to find things are not quite the same. At one point in The Other Side of Town, the strange man is reading the sports page and the taxi driver asks if he likes baseball. 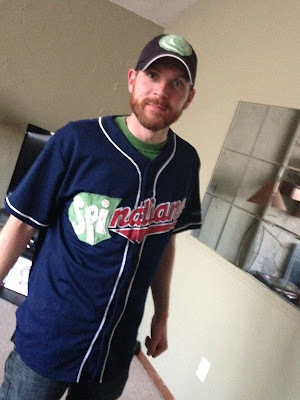 He replies, "I root for the Spankees." The taxi driver says, "You mean the Yankees?" Then, the strange man says, "No, the Spankees. They are the best team on THE OTHER SIDE OF TOWN." This is our favorite part of the book. 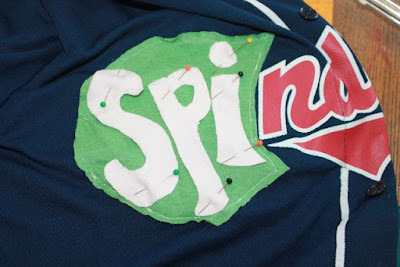 If my kids hear someone say "Yankees" on TV it is guaranteed they say, "You mean the Spankees!" I had this kooky idea to create my own OTHER SIDE OF TOWN baseball team based on our hometown team of the Cleveland Indians. 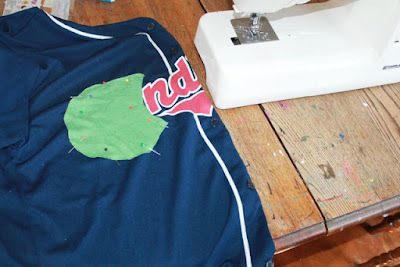 I had a Cleveland Indians jersey that we received free as a promotional item at one of the games last year. 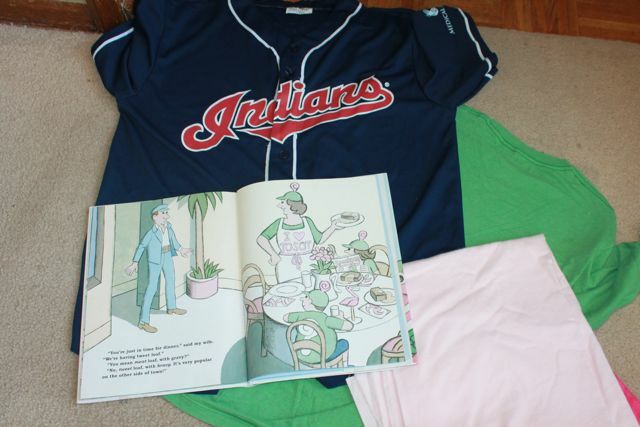 I also found pink and green fabric which are prominent colors in the book. I decided to call my team the Spindians. Do you mean the Indians? 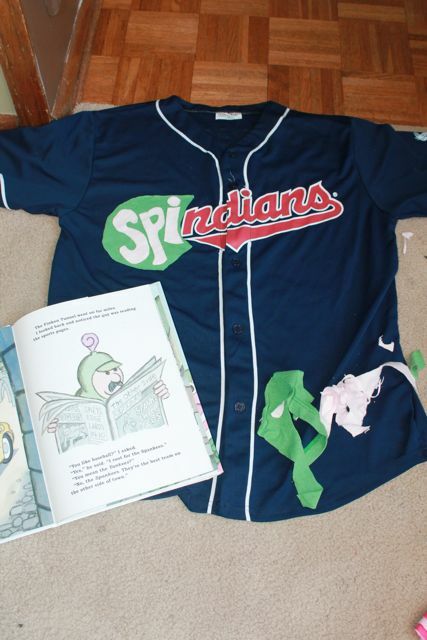 No, the Spindians. 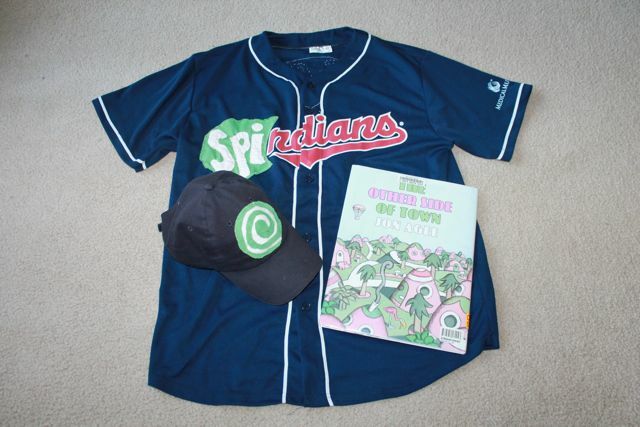 They play against the Spankees on THE OTHER SIDE OF TOWN. 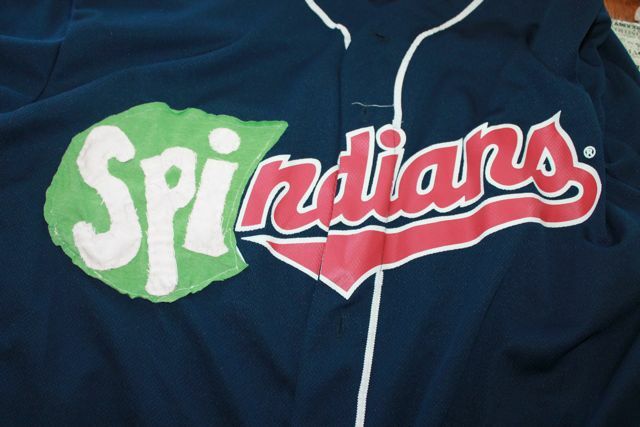 The most challenging part of this project was to cover the "I" in Indians so I could change the name. 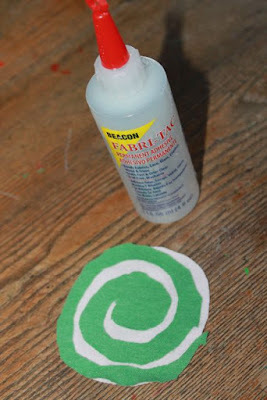 First, I sewed a piece of green fabric over the I. 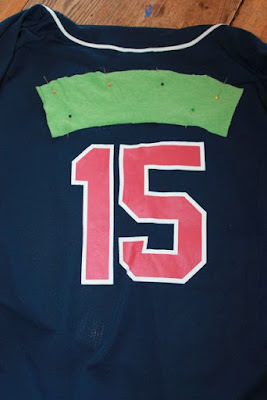 Then, I added the SPI letters I cut out of the pink fabric. I was surprised that this was working out the way I envisioned. 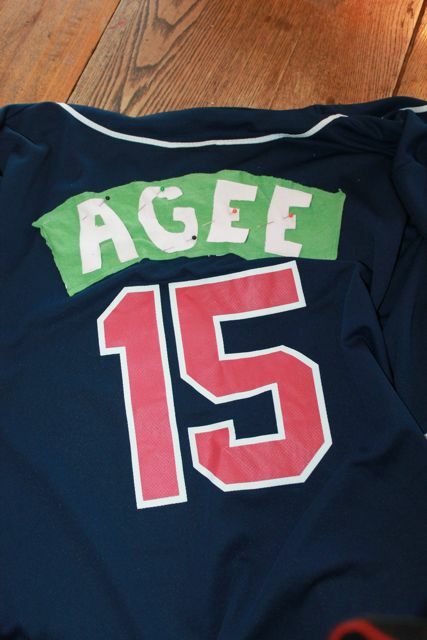 I wondered what else could I do to make this jersey even more awesome! I covered the name on the back of the jersey. I thought if I could make a jersey. I could make a hat, too. So, I made this logo that was inspired by the strange man's funny hat in the book. 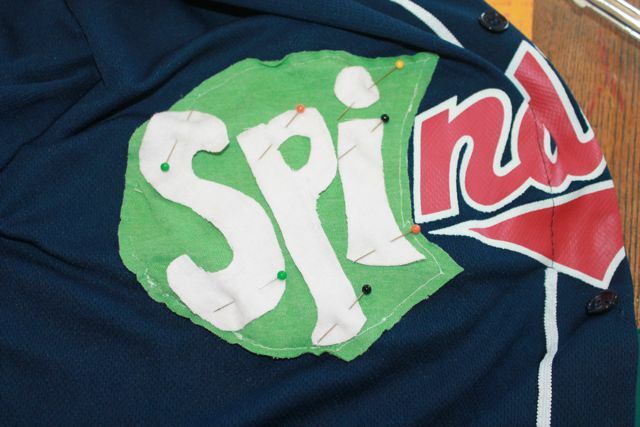 I glued the green and pink fabric with fabric glue and then glued the logo onto a navy blue hat. Now I have the perfect outfit to wear when I read this book. read the book with my kiddos one more time! !